First of all, I would like to thank our readers for their good wishes in connection with the 600th issue of The Oxford Etymologist, for their comments, and suggestions. In more than ten years, I must have gone a-gleaning about 120 times. I also appreciate references to the sources I either missed or may have missed. As far as the origin of numerals is concerned, I should say that the bibliography of each is a bottomless pit. Just for comparison: in my database, there are 92 items for five, 70 for ten, 45 for eight, and so on. Old periodicals are also countless. I followed Stephen Goranson’s hint, and one of my faithful volunteers has screened The Athenian Oracle. Unlike The British Apollo, it yielded nothing related to words or idioms. The Athenian Mercury is still hanging fire. In my mid-June etymology gleanings, I wrote that the term schwa had been first used in Indo-European studies by Eduard Sievers and not by Jacob Grimm, as Wikipedia stated, and I was delighted to see that the mistake had been corrected, with the reference to that post. And as long as I am dealing with schwa, I must say (in response to a question) that no, schwa is not directly responsible for the off-putting appearance of some Polish words and names. But yes, in Polish, unstressed vowels were lost in some syllables, and this circumstance resulted in the emergence of heavy consonantal clusters. 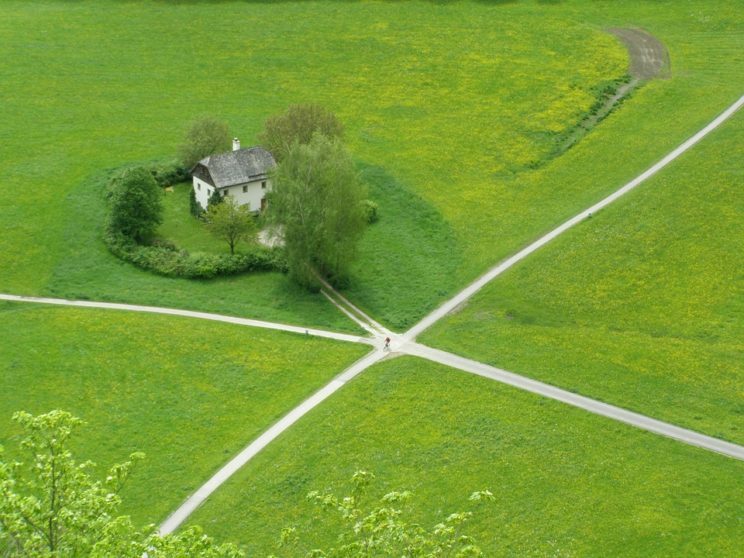 A crossroads. Singular or plural? To return to one of the things that evoke my anger. Despite the ambiguity, I am sure the antecedent of evoke is one, not things. The sentence John is one of the people who are… poses not difficulties: of course, are refers to people! An acid test of your conviction is the position you will adopt as an instructor of English as a second language. It is easy to be open-minded at home. But if your student (from Germany to China) asks you about that sentence with evoke, what will you say? Both are correct? One is preferable? One is wrong? I’ll be happy to read your comments. Sneak-snuck is a “famous” example. See my old post for 14 November 2007: “Sneak—snack—snuck” and the comments following it (dig is also mentioned there; I doubt its French origin). Those around me (the American Midwest) seem to favor snuck. But this form says little or nothing about the productivity of ablaut; at best, it testifies to the power of analogy: sneak-snuck as strike-struck. The same holds for crank–crunk cited in the comment (the model is drink-drunk). In all the Germanic languages, strong verbs (that is, such verbs as follow the model of ablaut) tend to become weak; hence dived rather than dove, and compare thrived–throve. Very rarely, weak verbs (of the liked, begged, wanted type) go over to the strong class: snuck is such a pseudo-strong verb. But “productive” presupposes a living model. Suppose that you have never heard the verb wive. It won’t occur to you that its past tense is wove, even though you know drive-drove and perhaps say throve and dove. The same holds for my examples in the previous post: brolly, wodge, and frosh. Those are occasional humorous formations; yet ablaut remains unproductive. They put on a pair of new sneakers and snuck away. Skeat wrote in 1867: “What is required in a helper is, still more than ability, the possession of patience, industry, accuracy and leisure.” And in 1890, when work on the dictionary was in full swing, Murray kept discovering gaps in his data. Here are some of his questions, slightly paraphrased. “Did any one use the phrase to show the cold shoulder before Walter Scott?” “Can anyone provide quotations for trailing one’s coat-tails ‘to provoke or challenge to a fight’”? (The phrase was used in “newspaper leaders [and] extra-parliamentary speeches.”) “What men and women are said to be of a certain age?” (This is a fateful question!) Instances of blue devils “melancholy, a fit of spleen” before 1800 are needed. “A man and a brother: Where does this expression, so often quoted in connection with the slavery question, first occur”? I have no doubt that at Oxford all these materials have been stored and studied, but to those unconnected with the OED a glimpse into the progress of the great dictionary may be of some interest. These people certainly have leisure, but will they work as helpers for the OED? 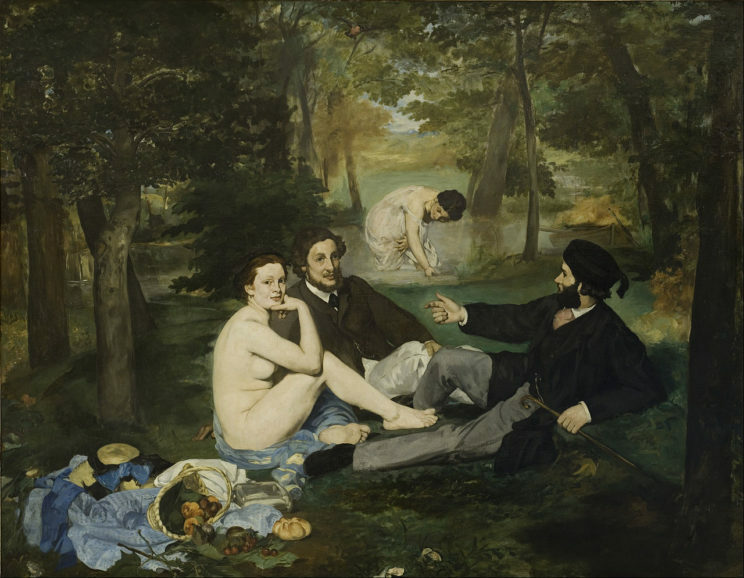 Featured image credit: “Luncheon on the Grass” by Édouard Manet, Public Domain via Wikimedia Commons. What is the IE root for “know” and “gnosis”? And what is the history for the English “know”? The Greek “gnosis” is well rooted and well connected with many other Greek words. 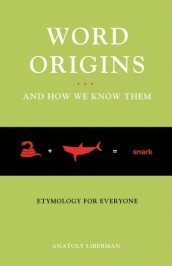 Like “nous” and “numero” and “agnostic” and “gnome” and “gnorizo” and “gnosto” and many others. Anything remotely similar with the English word “know”? When two words, seemingly cognates, are derivative? One word deriving from the other? I like to know. Thanks for this; there is much here to mull over. Supplementing your example of doubling of prepositions, the voice mail menu at my doctor’s office has a null preposition: “Your call will be answered in the order it was received.” As to your acid test for correctness, how about a double-barreled alternative for fluent speakers. (1) Would I use this expression in unguarded speech? (2) If I did use it, would I not notice the usage? An affirmative answer to (1) means that it is grammatical; affirmative to (2) means that it is correct. Congratulations on reaching 600 issues. Thank you for all the enlightenment and diversion you have provided over the years. We can (without significant change of meaning) rewrite the sentence, “Sloppy grammar is one of the numerous things that evoke my anger” as “Numerous things evoke my anger. Sloppy grammar is one of them.” The second sentence shows that the antecedent of ‘that’ in the first sentence is ‘numerous things’. ‘That’ “stands for” ‘numerous things’. In such sentences it is the relative pronoun ‘that’ that has an antecedent. The verb in the relative clause (‘evoke’ in this case) doesn’t. To say “I am sure the antecedent of evoke is one, not things” doesn’t make sense (and doubly so). Written English is used for serious purposes such as constitutions, laws, treaties, contracts, medical instructions, safety manuals in the nuclear industry. Clarity of grammar goes with clarity of thought. We don’t gain in expression when we accept sloppiness in grammar and call it ‘standard’. The development of the resources of grammar is as much a intellectual achievement as the development of mathematics, medicine, law, logic, philosophy, and science. The achievement of clarity is always a struggle. The standard of what is acceptable or correct should be higher than the average usage of those get by without needing too much in the way of precision. Or perhaps we are happy to patronise the everyday and not care too much because we don’t think everyday people and things matter too much either. Thanks for link to your article on sneak/snuck. I think it does sound more emphatic. “-ed” as a weak ending really is weak, since the “e” is barely pronounced. Not the way one would design an optimal language but that’s not option. I should warn learners of English that ‘snuck’ and ‘dove’ do sound very uneducated to those who don’t use them.